Anybody who knows Barcelona well knows that it’s bursting with cool co-working spaces and quirky offices, offering a hip and convenient new way to work. However, whilst co-working spaces are very appealing to some, many people prefer to take the old-fashioned route of a cosy café surrounded by indulgent cakes, coffees and comfortable furniture. 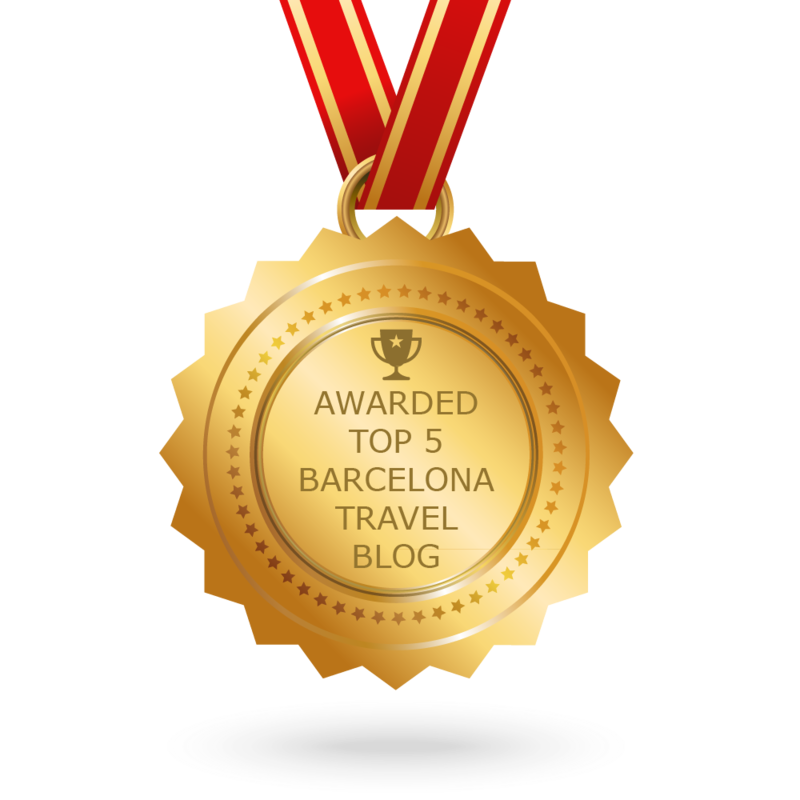 So, without further ado, here’s our guide to some of our favourite cafés for working and studying in Barcelona! Federal Café is most definitely making noise in Spain’s growing brunch scene, with branches in Barcelona, Madrid, Girona and Valencia. For many, Federal is the top spot for studying and working due to its spacious interior, natural light and speedy Wi-Fi. Plenty of small and large tables complete with plug sockets welcome workers to this cool café. Their menu consists of traditional brunch and breakfast favourites along with plenty of tasty treats to satisfy any sweet tooth. As well as this, Federal is a dog-friendly establishment, so if you want to bring man’s best friend for some emotional support whilst you drown in deadlines, you are more than welcome to at this study hotspot. Their outdoor seating area also makes for the perfect place to take a break and bask in the Mediterranean sunshine during the warmer seasons, so grab a book, sit with a treat and a coffee and get stuck in! Situated in Sant Antoní, just a short walk from Federal, Coco Coffice definitely stands out for us – if not for its light and trendy interior, but for its clever concept! 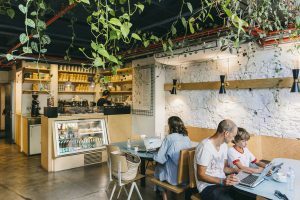 This quirky establishment combines coffee and office work (which explains the name) in a new co-working concept in which workers pay for the time they spend there. Sounds like any normal co-working space, but the twist is that during your time in Coco Coffice, you can help yourself to whatever is on offer in the kitchen, which is a variety of teas, coffees, fruits and snacks – the perfect combination to ensure you feel right at home! There is also a small meeting area available to book as well as a mini-boutique with stationary and magazines. Tariffs range from €3 an hour and there are a variety of flexible offers to suit your working and studying needs – we’re sold! 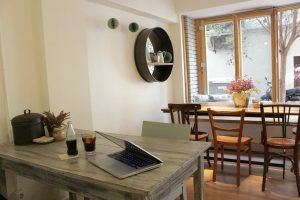 With branches located in both Eixample and El Born, Alsur Café makes for the perfect spot to grab a bite to eat and get stuck into your work. The free Wi-Fi, quirky décor and chilled vibe will be sure to make you feel right at home whilst you study or get some work done (with a slice of cake by your side, of course). The menu offers a variety of different of coffees, teas and juices as well as an extensive brunch menu with dishes to make your mouth water. 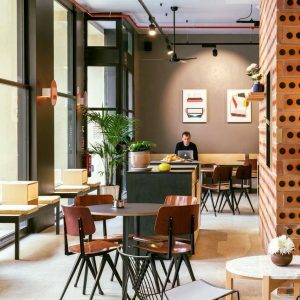 The branch located in Plaça de Sant Cugat in El Born has the perfect corner for those heading to the café to get some work done, with plenty of comfortable individual tables and a large table for group workers. However for ultra comfort, head to the branch opposite the Palau Nacional de la Música Catalana on Carrer de Sant Pere Més Alt which offers sofa-like seating, enough to keep you there for hours! 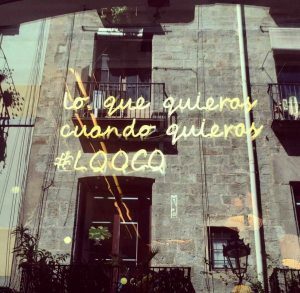 Additionally, the café has a well-known tagline advertised on their windows which reads ‘’lo que quieras, cuando quieras’’, which is Spanish for ‘’what you want, when you want’’, and boy does this café most certainly do what it says on the tin! If you’re an avid coffee lover, Satan’s Coffee Corner is the ideal workspace for you. Known for their ‘hellishly good coffee’ (hence the name), their incredible coffee menu changes weekly, and you can even buy their coffee blends to take away in 250g bags, as beans or freshly ground! The idea of setting up the cool café came from Marcos Bartolomé, a native of La Rioja from a family of coffee-makers who wanted to continue what he’d learnt from childhood, but in his own way. With a menu that updates as the seasons change, Satan’s Coffee Corner is also making its mark on global street food that’s healthy, while steering clear of clean eating clichés. As well as this, the minimalistic yet quirky interior makes for the perfect place to unwind and get some work done whilst indulging in every type of coffee under the sun. Situated in the trendy Gràcia district, this cute café is a favourite of many, perhaps due to its extensive menu of delicious dishes and colourful natural juices, or its neutral yet stylish interior. Whatever the reason may be, Petit à Petit is the perfect spot for hanging out, working or studying! Expect simple yet delicious snacks such as goat’s cheese salads and smoked salmon baguettes, and not to forget, plenty of sweet treats! Large windows and lots of natural light will be sure to make you feel refreshed as you embark on your journey of getting some proper work done. Note that there is also a small children’s play area, so we recommend heading to Petit à Petit during school hours to ensure minimal noise when trying to work.